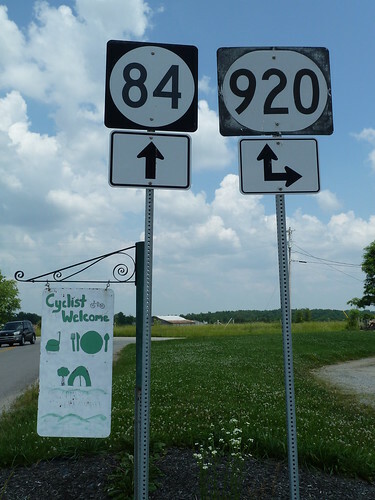 Another pleasant few days riding through Kentucky, mostly nice back road routes from Hodgenville KY through to Falls of Rough KY and a night at the Cave Creek camp site. This was followed by a days big dipper riding, long straight roads with fast down hills and big ups, but never enough speed from the downhill to get up the up hill! Our usual mid day lunch stops consist of Gas Station or Supermarket food, all wholesome stuff! My bizarre eating habits are still baffling me, usually a savoury guy, I’m now lunching on yoghurts and pots of fruit segments, not even the delights of the Gas Station Deli counters can tempt me! Now when I say Deli many of you will think, cold meats, tasty salads and exotic delights! Nope, Gas Station Deli’s have a collection of deep fried items, such as wedges (jojo’s), corn dogs and foil wrapped burgers, that have been cooked, one would assume, early in the morning and just left to fester in the hot cabinet until an unfortunate passer by, (usually Tony) decides to purchase the aforementioned haute cuisine! It was during one such food stop at a Gas Station on Highway 62 near Eastview KY, that I was treated to a delightful phrase that made my day. I was perusing the fineries of the Deli cabinet when one of the Daisy Duke cashier girls who were chatting up the baseball cap wearing pick up truck driving locals, shouts out Dagnabbit. I wasn’t aware of the context but it was a good enough sign we were out in the back of beyond; I’ll trade half a dozen Howdees for a good Dagnabbit any day! A few miles before Madrid KY, we were yelled at by 3 girls in a garden “Pull over at the gas station and my Daddy will give you a free popsicle”. Free and food in the same sentence are enough to stop any long distance cyclist in his tracks. We found out that the owner of the garage had been looking after Trans Amer’s for some years and offered camping behind the gas station. We signed the guest book and had a good laugh and a chat whilst sucking on our free ice cold popsicle’s, which in 90 degree heat were divine. His store was a hotch potch of food, tractor spares, fishing gear and various nuts and bolts. The Gas Station owner asked us if we had seen his cow bells and started to head off down the store, we dully followed, he stopped “you know why I stock cow bells?”…..”er no” we replied, somewhat bemused… “Cause their bloody horns don’t work!!”. That joke is bad at the best of times, but being lured into it and having it told in a deep Kentucky drawl gave it much more comedy status! We left after a chat with the girls; the eldest insisting we take her little sister and drop her off at the County line. We saw our first Amish folk today, they went past in a horse and buggy, I took a photo and I thought I might have offended them, but they turned smiled and gave us a wave. We should also by going through Mennonite areas soon, there a sort of Amish lite, they have cars (only black ones, no chrome) and can use power tools, electric etc. I had a celebratory can of Monster, Caffeine fruit drink today to celebrate 1000 miles on my speedometer. the drink helped with the 75 mile journey to Sebree KY Baptist Church. We thought we wouldn’t make it as at Beech Grove KY day turned into night, the animals went quiet and a storm of biblical proportions hit. We sat it out in a Gas Station drinking coffee whilst the roads turned to rivers and thunder and lightning crashed around us. After 40 minutes we headed out for the final push to Sebree, our last hold up being to help a very large man replace his punctured tyre by the side of the road. My good deed of the day was rewarded with an amazing meal of smoked ham and turkey with macaroni cheese followed by lemon pie and lots of iced tea, cooked by Pastor Bob's wife Violet. The Church youth centre where were staying is just amazing, every facility we could ask for and as usual the price for this hospitality….. nothing! Another first on this trip, I cycled through a Time Zone, I’m now in Central Standard Time. Welcome to CST, Stu! Join the club! !